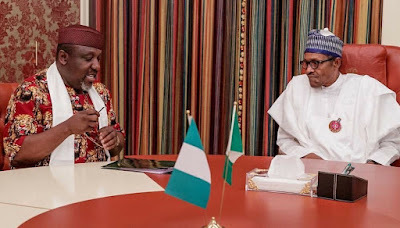 All Progressives Congress (APC) governors forum chairman and Imo state governor, Rochas Okorocha on Monday met with President Muhammadu Buhari behind closed doors. The meeting took place in the president’s office at the State House presidential villa, Abuja even as Okorocha is currently under suspension by the governing party. He fell out with the leadership of the APC after the party chairman, Adams Oshiomhole, accused him of trying to impose his son-in-law, Uche Nwosu, as his successor. Also, Okorocha, who won a seat as the senator representing Imo West under the APC, is yet to receive his certificate of return from the Independent National Electoral Commission (INEC). The electoral body said the returning officer for the election declared Okorocha winner under duress.